All products are formulated and produced at our Swiss laboratories in accordance with the most advanced scientific findings for skincare and skin health. Our formulations are made with natural, raw materials, carefully selected and tested for quality. We use prime natural ingredients that harmonize with the body's natural processes. We include ingredients such as elderberry extract, lavender water, sweet almond oil, sunflower oil, jojoba oil and natural citrus extracts. For optimum results we suggest using both products interdependently within a package such as the Swiss Skincare Classic and the Swiss Body Classic, however they are available for individual purchase. We utilize pharmaceutical-grade ingredients, containing plant oils supported with active ingredients from herbs, biological extracts, and vitamins. These products contain no perfumes, drying alcohols, coloring agents, mineral oil or waxes. 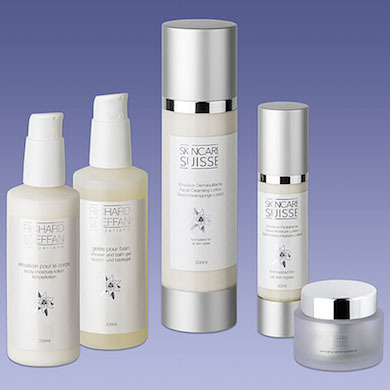 All Skincare Suisse products are paraben-free. By working with the body's natural processes, our products enhance the skin naturally and provide it with that which nature intended. Our first step is to ensure product purity. To accomplish this, we formulate and manufacture our products in Switzerland under the most stringent hygienic conditions. We do not engage in animal testing. This process occurs without needing a myriad of unnecessary products so widely promoted. Thus, when it comes to quality skincare, less is definitely more.